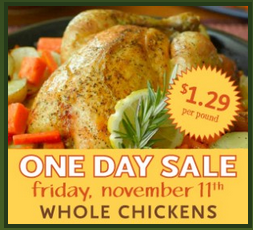 At Whole Foods Market, this Friday (Nov. 11, 2011), you can get whole chickens for just $1.29/lb! There’s a 10 whole chickens per person limit. Get there early before they sell out.